Browse » Home » Philippine Numismatic And Antiquarian Society , PNAS » The Philippine Numismatic And Antiquarian Society: "A Lost Legacy?" 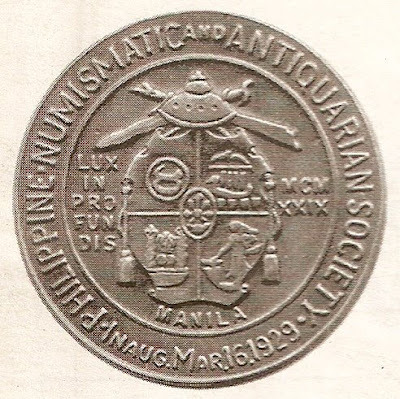 The Philippine Numismatic And Antiquarian Society: "A Lost Legacy?" Recently, I was surprised to know that the Philippine Numismatic and Antiquarian Society, the oldest numismatic organization in the Philippines is bombarded with political controversy. Two factions emerged, a newly set of elected officers facilitated the establishment of a new governance mostly composed of younger members while the other faction, the incumbent officers, who declined to submit to the majority, remained and decided to continue their own version of the organization. So now, there are two Philippine Numismatic and Antiquarian Societies. Both are competing against each other and have concluded their respective auctions both on same set of dates. The incident started when last December, the organization held its annual election. Majority of the officers who won the election elected their pick for presidency. However, the minority of the group did not accept the mandate. Thus, started the creation of two organizations. The first one is headed by Tomas De Guzman, Jr. or “Temboy” as he is known to fellow numismatists. On the other hand, Atty. William Villareal leads the other faction and installed himself as president otherwise. It’s a disgust to see how greed took over on this once prestigious and respected organization. If Gilbert Perez and other pioneers are here to witness such debacle, they could have scolded these members as if they are just five-year-old kids. It’s a pity how PNAS devolved rather than evolved, since most dealers now control the organization’s interest. Nowadays, online auction such as Ebay became available to local dealers, agents, and collector. The market of coins, ephemera, and other antiquities are big business especially that the market of silver, gold, and other strategic metals is on the rise. Greedy officers in order to protect their interest have manipulated the organization for so many years that they resorted to every corrupt means just to maintain and stay in power. I myself had campaigned for the organization’s reform. But since I have realized that the people whom I trusted my faith with were also dealers who just wanted to replace their competitions and push for their own version of monopoly, I have decided to throw the towel and leave the fight between them inside their own ring. Meanwhile, I can campaign for reform in my own turf, through the Internet. Foremost, a collector should always remember that these commodities though have achieved and were realized in large sum of money at the auctions facilitated by names such as Sotheby and Christies. Still, it’s not a guarantee that this type of scenarios usually happens. Most of the times, these articles were not even sold nor worst collectors just surrender them to Museums either out of frustrations or they have just grown tired on keeping these items in excellent conditions. It’s really hard maintaining these pieces because mishandling could lessen or even totally lose its value. For example if you own a coin in mint condition and has a catalogue value have let’s say a $100. In case that you’ve dropped it or if it accidentally accumulated fungus, its value might be greatly reduced to just $10 unless you applied and treat it with the right chemical which can only be bought abroad and might as well has a price tag of $100. Another issue to be considered is the rampant counterfeiting and proliferation of so many fakes in the market. That these fakes are so, so, so good, that you can be easily fooled more than twice. That is why most finds were easily discarded and assumed fakes just to learn that it is being forwarded without certification unless your selling as if selling a piece of pie. So as a collector, it’s already a sacrifice to pay for something and continue buying those things even after so many sad experiences. It’s a lot of guts I tell you. So, organizations such as PNAS should confront more such annoying issues rather than doing more auctions. Education and helping to raise new collectors would keep the organization fresh and competitive. I think its time for the organization to realize that values were set by collectors and not by the catalogs. If nobody is aware that an item is that valuable because none have taught them then who would buy them at such price. Information is vital for collectors, and without collectors there are no successful auction results.